Every vocalist can benefit from having professional-grade reverb and studio effects to sound their best on stage. This is what the BOSS VE-1 Vocal Echo is designed for-to make your voice sound even more incredible when you sing. It provides lush reverb and other essential vocal tools magically packaged in a compact and user-friendly unit, allowing you to easily create a great ambient vocal sound every time you perform. What's really cool about the VE-1 is that you don't have to be a pro sound engineer to make your voice sound sweet. Everything is right at your fingertips to get great-sounding vocals anytime and anywhere. Whether you're a newcomer to the world of audio effects processing or a highly trained PA engineer, the VE-1 provides high-quality processing for any singer to take their voice over the top with that extra luster and polish. With the VE-1, there's no need to worry about complicated parameter settings to achieve rich results. Simply dial up a sound from one of the seven available professionally designed presets, and then twist the knobs to easily and intuitively control the effect level and depth. And if you're a more advanced user, additional detailed parameters are available to fine-tune sounds even further. Along with the top-quality reverbs, dedicated controls are right at your fingertips for applying Double, Pitch Correct, and Enhance features to your vocals to put the finishing touch to your sound. Pitch Correct helps you to stay in tune, and also allows you to obtain that characteristic "electronic voice" sound. With the convenient Memory feature, you can store and recall up to four favorite settings, including your current live setting. The built-in USB audio port enables you to record your polished vocal sound directly to a DAW or create a studio-quality sound for a YouTube performance. 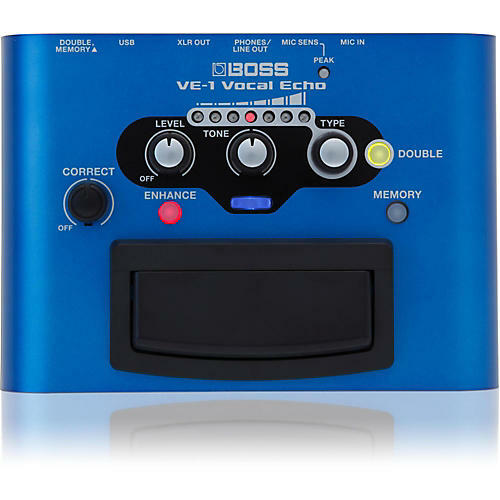 The VE-1 runs on batteries or AC power, and works great in any situation, from street performing to recording in your home studio to performing live at a caf or club. Most vocalists don't have the luxury of a pro sound engineer to dial in the perfect ambient vocal sound for every performance. The VE-1 is the perfect all-in-one solution to simply and easily get great sound without any outside help. Whether you're a street performer or playing at a local caf or club, you'll always sound like a pro when you sing with the VE-1. The seven built-in presets don't simply increase in depth or intensity as you step through them-they each contain multiple reverbs that are intricately adjusted for every setting. These variations provide the most suitable settings for each depth level, blending in beautifully while never overwhelming your direct vocal sound. BOSS engineers have used their decades of accumulated expertise in vocal reverb to design and meticulously craft these studio-level adjustments along with input from top recording engineers from around the world. This results in great ambient vocal effects that are easily obtained in any live situation, providing a big advantage for any singer! Studio-grade reverb is crucial for every vocalist. The VE-1 is designed for anyone who wants to sweeten their singing with beautiful ambience and sound like a pro. It greatly enhances any voice with spaciousness and sparkle, and it's really easy to use, even if you're a newcomer to the world of audio gear. The VE-1 is especially valuable for vocalists who perform with a minimal PA setup in a caf, club, or any other live setting. As a vocalist, you˜re always the center of attention-you not only sing, but you speak to the audience as well. Sometimes you need to design a different vocal ambience from one song to another. With the VE-1's built-in memory, you're able to simply switch between the ambient vocal sounds you need for different song styles. Between songs, you can easily bypass the ambient sound while the Enhancer remains active, which is perfect for speaking to the audience. You can choose from four different settings, including your current live setup with the VE-1. Aside from the sweet ambient vocal sounds you can easily obtain with the VE-1, there's also a built-in USB audio port to record to your computer. This is a particularly great feature for making professional-sounding YouTube videos that show off your incredible vocal ability. But we didn't stop there-with a microphone connected to the VE-1, you can record your vocals along with effects directly to your favorite music software. You can even mix in a song played back from your computer at the same time!